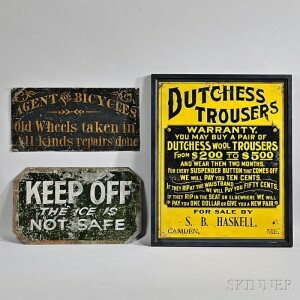 Antique Trade Signs | Skinner Inc. There are few objects that get attention at a Skinner Americana auction the way that antique and vintage trade signs do, and they’re one of my favorite categories we sell. 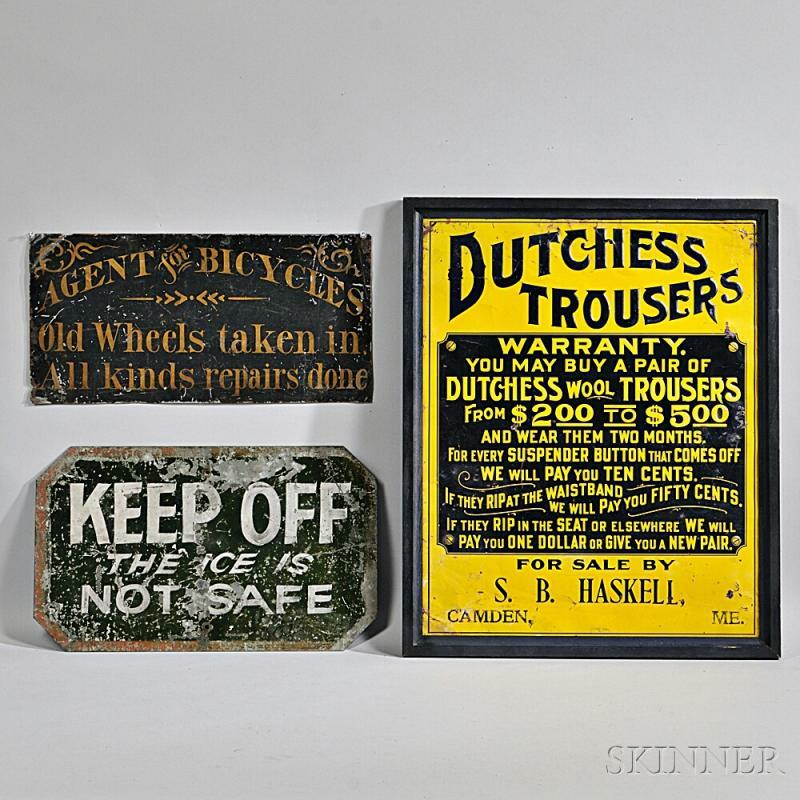 These signs, often painted on wood or tin, were generally used to advertise businesses, identify work that went on in a particular building, or demonstrate what was for sale at a given establishment. Many signs are carefully crafted by hand, lettered in gilt or colorful paint on contrasting backgrounds, sometimes incorporating pictorial elements or elaborate decorative flourishes. Like any advertising; design, color, content and overall visual appeal are of utmost importance – accomplished combinations of those are the most successful, and valuable, examples. While the original intent of a trade sign was almost wholly utilitarian – to get business – present-day collectors also appreciate them for a variety of reasons unrelated to their initial purpose. Like the artwork of famous Pop Art master Ed Ruscha and other artists, who incorporate text into their work, require the viewer to read and make a personal connection with the content of the words. Trade signs have that same direct personal appeal, since they advertise things that we all can relate to – a hobby we love, a job we do, a banal task, a favorite food, drink, place, or name. The same way one makes a personal connection to a painting of a favorite location, scene, or activity. Ruscha also used words to introduce a layer of satirical humor, and there is an important element within the trade sign market that appreciates the humor (sometimes unintended) found in the signs. That humor can come from examples that use outdated or anachronistic terminology, that include prices for items that in the present day seem comically low, that are worded to address an overly specific 19th century situation, or that simply seem to make no sense. A sign sold recently at Skinner read “HOT SODA” and garnered a lot of attention! 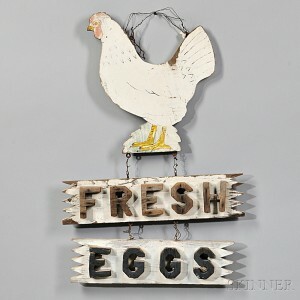 In the June Americana online auction, we are pleased to offer a variety of trade signs of all types – small tin ones advertising trousers or an “AGENT for BICYCLES,” a white-painted wood sign showing a chicken with carved letters “FRESH EGGS,” larger wood ones lettered “LUNCH,” “DRESS MAKER,” and (of all things) “NEWARK AIRPORT,” and fanciful oversize signs lettered “UNDERTAKING” and “PAINTS & OILS.” As usual, these signs will get people reading, and then talking, and then bidding! Americana Online runs from June 8th through June 16th at 4PM. View all lots on offer here. This entry was posted in Blog and tagged American Furniture and Decorative Arts, Americana, Antique Advertising, Antique Signs, Ed Ruscha, folk art, Hand-painted, online auction, skinner, skinner auctions, Tin Signs, trade signs, Wood Signs by Chris Barber. Bookmark the permalink.